Pope Gregory VI (Latin: Gregorius VI; died 1048), born John Gratian in Rome (Latin: Johannes Gratianus), was Pope from 1 May 1045 until his abdication at the Council of Sutri on 20 December 1046. Gratian, the Archpriest of St. John by the Latin Gate, was a man of great reputation for uprightness of character. He was also the godfather of Pope Benedict IX, who was foisted on the papacy by his powerful family, the Theophylacti, counts of Tusculum, at the age of twenty. Benedict IX, wishing to marry and vacate the position into which he had been thrust by his family, consulted his godfather as to whether he could resign the pontificate. When he was convinced that he might do so, he offered to give up the papacy into the hands of his godfather if he would reimburse him for his election expenses. Desirous of ridding the See of Rome of such an unworthy pontiff, John Gratian paid him the money and was recognized as Pope in his stead. The accession of Gratian, who took the name Gregory VI, did not bring peace, though it was hailed with joy even by such a strict upholder of the right as St. Peter Damian. When Benedict IX left the city after selling the papacy, there was already another aspirant to the See of Peter in the field. John, Bishop of Sabina, had been hailed as Pope Sylvester III by the faction of the nobility that had driven Benedict IX from Rome in 1044, and had then installed him in his place. Though Benedict IX soon returned, and forced Sylvester III to retire to his See of Sabina, he never gave up his claims to the papal throne, and through his political allies contrived apparently to keep some hold on a portion of Rome. To complicate matters, Benedict IX, unable to obtain the bride on whom he had set his heart, soon repented his resignation, claimed the papacy again, and in his turn is thought to have succeeded in acquiring dominion over a part of the city. With an empty exchequer and a clergy that had largely lost the savour of righteousness, Gregory VI was confronted by an almost hopeless task. Nevertheless, with the aid of his "capellanus" or chaplain, Hildebrand, destined to be Pope Gregory VII, he tried to bring about civil and religious order. He strove to effect the latter by means of letters and councils, and the former by force of arms. But the factions of his rivals were too strong to be put down, and the confusion only increased. Convinced that nothing could meet the challenges facing the Church except imperial intervention, a number of influential clergy and laity separated themselves from communion with Gregory VI or either of his two rivals and implored Emperor Henry III to cross the Alps and restore order. Henry III responded to these pleas by descending into Italy in the autumn of 1046. Strong in the conviction of his innocence, Gregory VI went north to meet him. He was received by Henry III with all the honour due to a Pope, and in accordance with the royal request, summoned a council to meet at Sutri. Of his rivals, Sylvester III alone presented himself at the synod, which was opened on 20 December 1046. 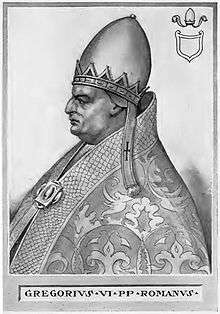 Both his claim to the papacy and that of Benedict IX were soon disposed of. Deprived of all clerical rank and considered a usurper from the beginning, Sylvester III was condemned to be confined in a monastery for the rest of his life. Gregory VI was accused of purchasing the papacy and freely admitted it; however, he disputed that this act, given the circumstances, constituted the crime of simony. However, the bishops of the synod impressed upon Gratian that this act was indeed simoniacal, and called upon him to resign. Gregory VI, seeing that little choice was left to him, complied of his own accord and laid down his office. Gregory VI was succeeded in the papacy by the German bishop of Bamberg, Suidger, who took the name Pope Clement II. Gregory VI himself was taken by the Emperor to Germany in May 1047, where he died in 1048, probably at Cologne. Gregory VI was accompanied by Hildebrand, who remained with him until his death. After about a year in Cluny, Hildebrand returned to Rome in January 1049 with the new Pope Leo IX (Bruno of Toul), successor of Popes Clement II and Damasus II. And when Hildebrand himself was elected Pope in 1073, he deliberately chose for himself the title Pope Gregory VII in order to proclaim his firm and loyal belief in the legitimacy of Gratian as Pope Gregory VI. This article incorporates text from a publication now in the public domain: Herbermann, Charles, ed. (1913). "Pope Gregory VI". Catholic Encyclopedia. New York: Robert Appleton.